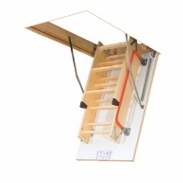 The LWK Komfort Loft Ladder is a premium quality folding 3-4-section Loft Ladder.It is equipped with an aesthetically finished insulated hatch in white and accessories enabling comfortable loft ladder usage as standard – stile ends and handrail. Steps protrude form the stringers facilitating climbing the ladder. The LWK Comfort Loft Ladder is a folding ladder made of highest quality pine wood, supplied with an insulated hatch door, red-painted metal handrail. The hatch door is white on the inside and outside. There is a considerable space between the treads and the hatch door. Such design makes stepping onto the treads easier, thus increasing the ease of using the ladder. Safety grooves are cut into the treads to prevent slipping. Treads are fitted using dovetail joints for added durability. The red-painted metal handrail is mounted on the ladder’s angle brackets. This makes climbing the ladder easier. The brown stile ends, mounted on the ladder feet protect the floor from scratching and increase the ladder’s stability.